Widespread Panic, the American rock band hailing from Athens, Georgia, will be performing at The Park Theater in October. This is a once-in-a-lifetime opportunity to watch this electrifying band live in action as they churn out electrifying vocals and mind numbing guitar riffs that will make you overwhelmed with ecstasy. Catch Widespread Panic live in Las Vegas. Fans of this music group already know that they have been in the rock 'n' roll scene for over 30 years now. 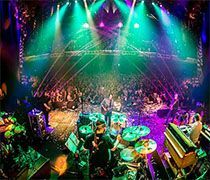 Since their formationin the year 1986, this rock group has risen in position among other famous American jam bands and currently enjoys elite status in the scene. The current lineup consists of John Bell (guitarist/singer), Dave Schools (bassist), Duane Trucks (drummer), Domingo Ortiz also popularly known as Sunny (percussionist), John Herman (keyboardist), and the Jimmy Herring (guitarist). With a steady and long lineup, they are once again getting ready to rock the stage with their fusion of South rock melody along with other genres like blues, hard rock, funk, etc. The group has often been compared to other southern bands like the Road Warriors, Allman Brothers Band, Grateful Dead because of certain similarities that they all shared in their music. The last sold-out performance by this band was at the Red Rocks Amphitheatre in Morrison, Colorado, in 2015. In the group's three decades of being in the music business, they have released a total of 12 studio albums that have sold more than 3 million copies worldwide, taking into consideration almost 43 live albums. Considered to be one of the most successful touring acts in the world, Widespread Panic has earned popularity among people of many ages since that time they released their debut album titled "Space Wrangler" on September 5, 1988. Starting out initially as a Southern blues band, they kept experimenting with their sounds, and thus results came year after year with every successful album release. Their latest album that released in 2005, "Street Dogs", grabbed the number 3 spot on the Billboard 200 chart. The band has headlined dozens of the main music festivals in the United States, which include Austin City Limits, Bonnaroo, Lollapalooza, and others. Now it's your turn to witness widespread panic Vegas in all their gritty and unadulterated form. The State of Georgia inducted this band to the Georgia Hall of Fame as a mark of respect on their 25th anniversary, thus turning over a new leaf in the long lineup of rewards and prestige is received by this music group. Houser proceeded to perform with the band till the first half of the year with his declining health but was eventually forced to retire following the performance on July 2 of the year. In his place, George McConnell took over the helm as the lead guitarist to complete rest of the band is scheduled to tour dates. Houser did not survive long after the diagnosis and died on August 10, 2002. About the new album " Street Dogs." Recently, John Bell spoke a lot about their new album and what had inspired them to make it sound like it does. He explained that Widespread Panic try to keep the sound like a raw and live as possible by trying to contain overdubs at a minimum. This was the time when JB was recording his sessions with their long-term producer John Keane at the Echo Mountain Studios. The best part about recording a new album which JB says is that it acts as a reunion of the entire band as they played together rather than in individual parts like many musicians do during their studio recordings. Most of the songs were recorded in a single take to keep the album feeling live and candid and not sound too polished. JB admits that they consider their latest album to be a milestone in their career because after being together for such a long time, they are still producing music that are all out hits. This is an album that is best experienced live and you too can enjoy the best of this album as widespread panic Vegas is said to turn up the heat once again in the coming month. The town of Las Vegas Nevada has played host to almost all popular bands and artists from around the world and is renowned for the party lifestyle that people throng to experience. You can expect nothing but the best regarding arrangements and amenities here because the place itself has a reputation to live up to. Widespread Panic is perhaps settling down and planning for their final performances, which makes it even more urgent for you to witness them live at The Joint. Seeing widespread panic Vegas live is considered to be an achievement by many Southern rock enthusiasts around the world because the band itself has proved their reputation worthy of being famous. This is the time that you need to hurry up and book your show because, by the looks of it, the upcoming three-day tour in Vegas is set to be a sold-out event that will once again make history for being one of the most heart-pounding performances ever bought up by a rock band. This will certainly be one hell of an event to experience!